The second Sixth Creek Caper took place on Sunday 11th October 2009 mainly along Taylor’s Creek, a tributary just north of the Marble Hill ruins at Cherryville. Again, the balmy Spring Sunday brought forth a large gathering of people, some dogs, and this time a baby kangaroo. First host was Naomi, who two years ago acquired the property from Margaret and Alistair Crooks. A major part of this land has natural heritage listing for its rare species and biodiversity. This property has been involved in the Project for 10 years and demonstrates the achievements possible from a partnership between the Project and dedicated landowners, old and new. We learned about the difference between managing the bush and managing country which had been orchard and since turned to pasture and woodlots; about the need for grazing of steep land; and about the pros and cons of bracken fern – a native and an invasive? Looking across the valley to the thick bush below the Ruin, locals told the scary story of the burn-off that got away some years back, took days to put out, but which in turn led to a unique opportunity for experiments in broadscale weed management. Local produce and home made bread was served for morning tea at the next property, by Andrea Ceres and Justin Roberts. We saw the hard work needed to pull acres of weeds by hand, grow your own vegies and fruit, and cunning ways to combine sheep and new fruit trees. 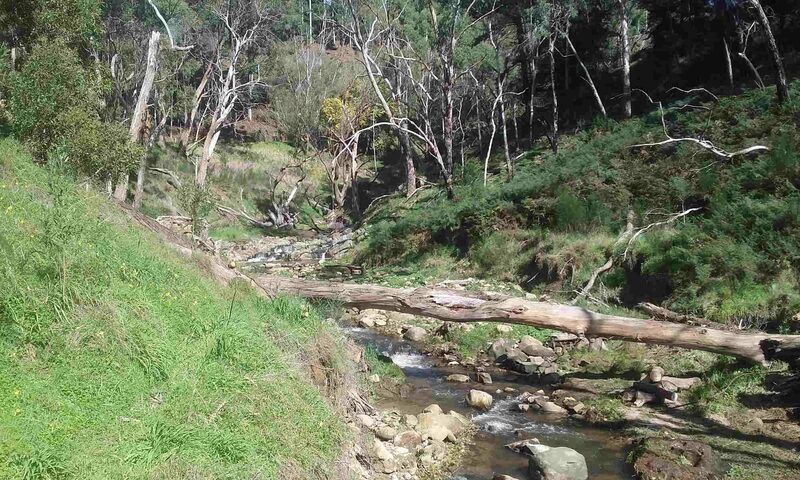 Reluctant to leave this beautiful homestead, we finally moved on and continued downstream along firetracks through Elizabeth Lonie’s property. Along the way we spotted a koala nestled in the fork of a Manna Gum, a common sight for locals but a treat for guests to the catchment. Eventually we arrived at Hugh and Wendy Stewart’s new place. They have tackled massive weed infestations from decades of neglect and fire has been a necessary weapon, but an unpredictable one. We were able to witness this from the blackened hillside and burnt gums of a very recent burn that had gone a bit too well. Further down the firetrack old Mr Vitols welcomed us to his property on Sixth Creek itself. Not in the Project, this farm, its orchard and animals, hens, geese and bees, has been lovingly tended for more than half a century – by hand – by a family from Latvia. Biodiversity and native vegetation may be reduced, but in contrast with its neighbours, this land is weed free, at least in the sense of the wrong plant being in the wrong place. The old peasant ways make sense here. Finally we arrived at Sue Campbell’s on Merchants Road which has Sixth Creek right there bubbling along just below the house, ideal for barbecue lunch and wine (again donated by local wineries). Sue talked to us about the amazing work she and Andrew have done on this 50 acre property over the last 10 years with the help of the Sixth Creek Catchment Group, removing over 30 Willow trees from the creekline and massive Blackberry infestations on the abandoned orchard facing the house. Again fire has been a valuable tool in the weed clearance and revegetation process. While lunch was being prepared Simona and Petar Spajic, Sue’s neighbours, led a group into their property. Listeners were inspired as they witnessed the results of their herculean efforts in cutting out and stacking bamboo from the riparian zone in preparation for spraying. Dylan Armstrong knows birds and told us that he identified 26 species on this short walk. This surely suggests that the Project’s biodiversity efforts are succeeding. His list and remarks are posted here. Mike Ladd, a writer and poet, is more interested in the people and their stories, and would like to write a Sixth Creek Chronicle. He has past experience having written a series of articles about the Torrens which were published in the Adelaide Review. Hand built stone walls holding up steep tracks on the hillside opposite where we sat, discovered only when the weeds were gone, strongly suggest that there are plenty of stories to be uncovered in this valley. Thankyou to all the landholders who allowed access through their properties, the generous people who made this event so much fun and educational, and to Terry Mc Ewen who took the photos accompanying this report. We look forward to the next walk in late Summer.